Back in the days of 'Christmas in the Country' - ten years of days, I had this entire house, the shop, the barn, the property, decorated to the hilt before the first weekend of November. After we ended that event, I'd start to decorate on December 1st - I'd kinda begrudge going through all that effort for only a month of enjoyment. This year, here it is, nine days til Christmas and my house looks more like a bomb went off than a fesitivity is approaching. Every year I think ... 'NEXT YEAR', I'm going to be organized. NEXT YEAR, I'm going to do my shopping weeks ahead. 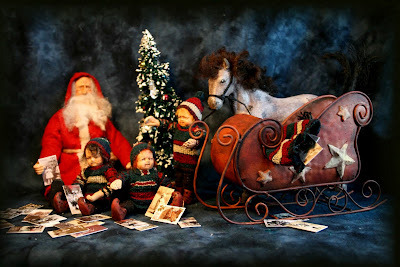 NEXT YEAR I am going to make a Santa for all of my children and one for me too. NEXT YEAR I will have everything wrapped & under the tree and will be able to sit and relax in the glow of the Christmas lights. I'll get to go to all the wonderful events that are happening. And I'll even get to watch some Christmas movies and put myself in the proper frame of mind to celebrate such an important occasion. And most importantly, NEXT YEAR I will find time to do some things for people who could use a kindness. It seems though, that every year I just get further behind. I'm not doing more, I guess I am just doing slower. At this point, I have no decorations up, I have nothing baked or bought and still need to finish up too many things. NEXT YEAR, I am NOT going to let this happen. The very good thing is that I am hosting Book Club here the day after tomorrow, so I know - even if I have to stay up all night, I will at least have the tree up. That's because it is laying in the middle of the livingroom and we simply wouldn't have anywhere to sit if I don't. And so, because of my need to get my act together on this front, I have had to put my Ebay creating on pause. I'm really disappointed about that. The time has gone way too quickly. I have loved spending time up in my studio - I hadn't been up there for months. And I especially loved to be re-connected with the dear folks that I have met over the past five years and to have the opportunity to meet new friends. That's a NEXT YEAR too ... that I will start my Christmas line way sooner. 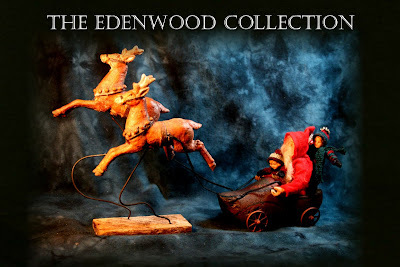 The last two creations for Christmas Line '009 are a 'Magic Ride' and 'E-mail'. My favourite childhood vision of Santa is with his reindeer flying through the air. That's why I love these little deer - they're in the perfect magical reindeer stance. I have to confess - I stole them from something else and I think I might be kicking myself. But when I came across the tiny handcarved, beat up little wooden shoe, there simply was nothing else that would do. Of course, stance aside, they were not right as they were, so I rebirthed them & painted them up. 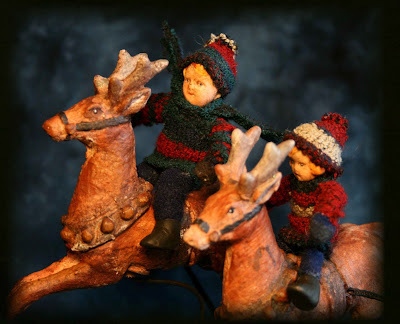 The other piece 'E-mail' has three chubby little elves with polka dot boots. 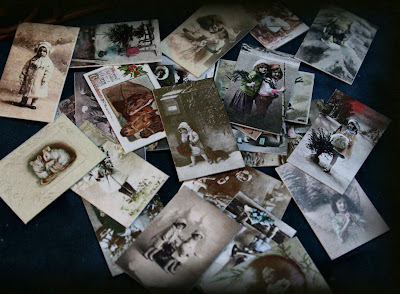 I love vintage postcards and I love little things - so I shrunk down my collection and filled the mail bag with them. Another thing I love is Words ... and on the back of each card there is a single word that will hopefully evoke thought or feeling. Time for me to put some thought into making this place feel like Christmas!